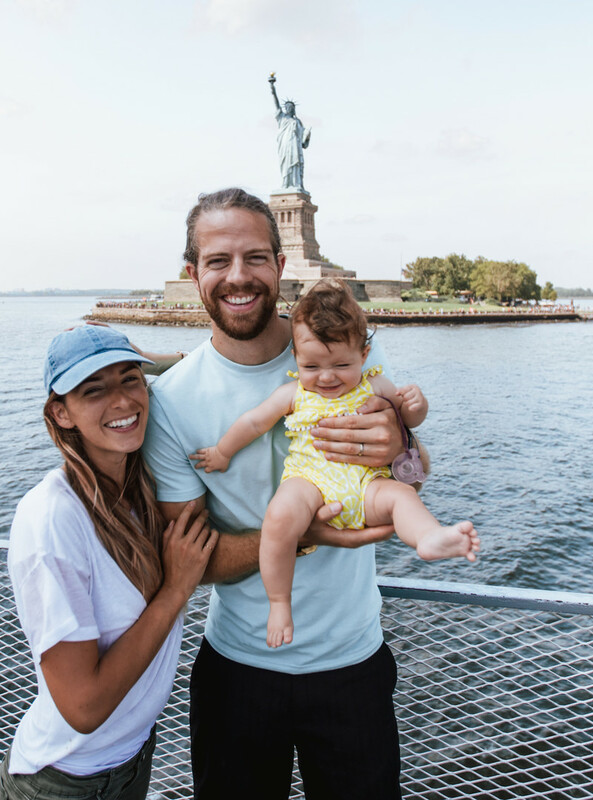 Bryce, Nellie and Avalyn comprise the adventurous Jurgy family, who have made an art out of life on the road. 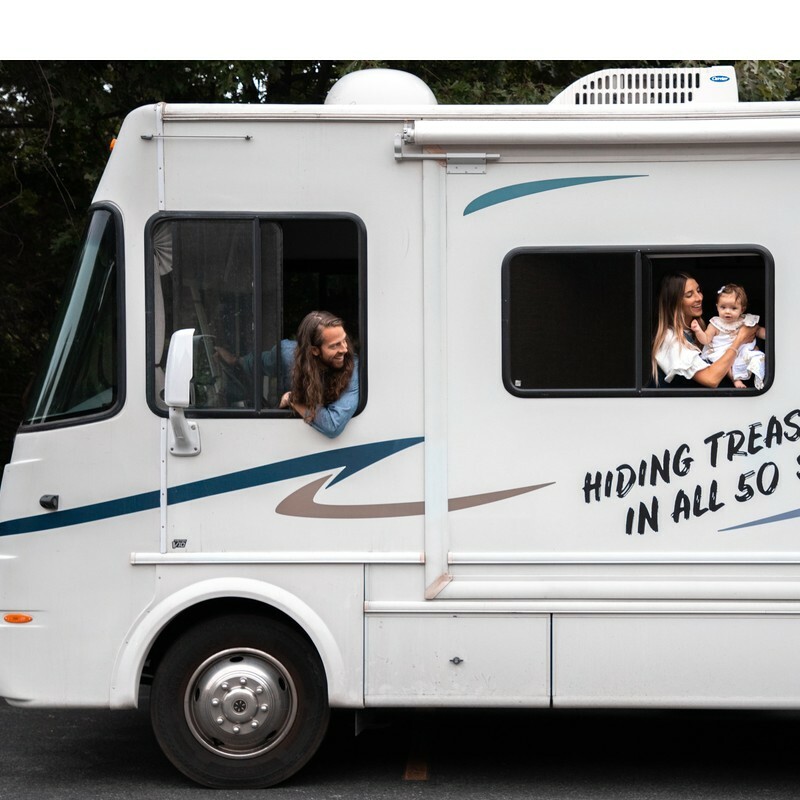 They’re traveling across all 50 states in the U.S. and hiding treasure for others to find. But the real treasure is all the amazing memories they create along the way. It wasn’t something I wanted to hear while driving our 35-foot prized possession. 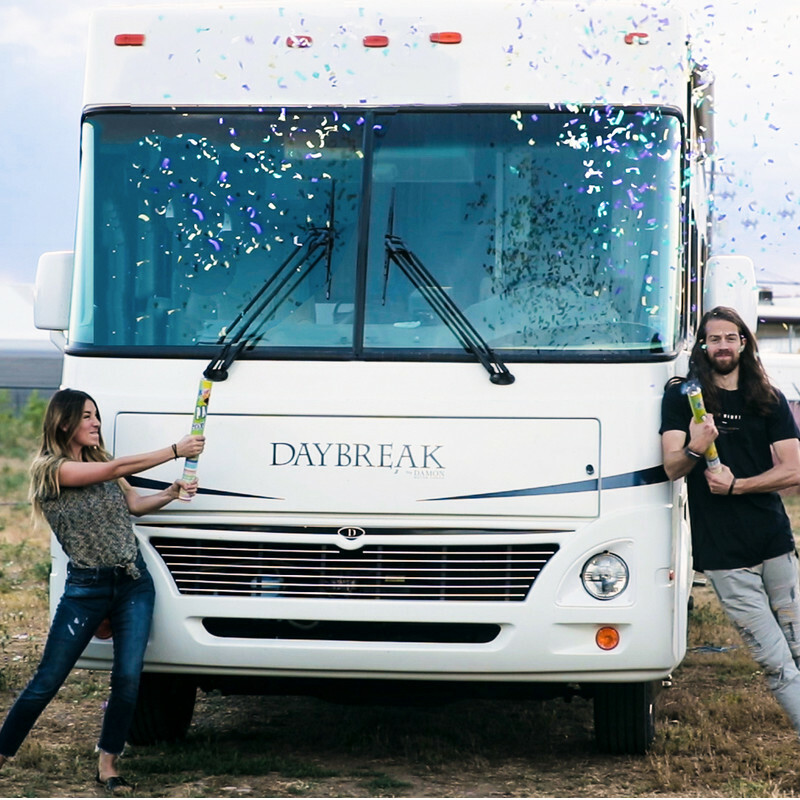 Our sanctuary on wheels that had brought so much joy suddenly became fertile ground for disaster. I quickly pulled over, our flashers and horn informing everyone we were in a dire situation. Traffic worked around us. Everyone supported and understood, I told myself as they honked and sped by at 70 mph. I got out of the motorhome, our biggest investment in making future memories, and hiked up the road. How could we turn around and block the least amount of traffic? We could potentially drive off-road onto some flat ground and reach another street 50 yards away. At that point, we could do a 3-point turn. Or more realistically, a 7-point turn. We couldn’t remember exactly how tall our RV was, but it was too close for comfort. And of course, we also couldn’t find our tape measure. Searching online, we found a forum that claimed our rig was actually 11’8” in height. We could make it. If we drove slow and no one jumped up and down. As we crept under the bridge, we realized how unprepared we were to enter the metropolis ahead, New York City. Hiding treasures in all 50 states, but the real treasure so far has been the countless memories we have of all our time together. New York was state number 20 in our series for our YouTube channel, The Jurgys. The goal: find adventure in every state and hide geocache treasures to motivate our viewers to get outside. We began our expedition in June, 2018, when our baby girl was just three months old, and up until that moment, Google Maps had served us well. But after the low-bridge scare, we decided we needed to make some changes if we were going to actually drive through the big city. We downloaded an RV GPS app, CoPilot, which guides you through roads that fit your rig. Searching the map extensively, we planned our route turn-by-turn in advance. We even found live camera feeds of New York City to see when traffic was least intimidating. We didn’t want to take any chances being “those people” who caused an unnecessary traffic jam because the city was so new to us. We called the New York City Department of Transportation and asked them if our route was okay to take. The officer informed us that because our RV carried propane, it was considered hazardous material and we couldn’t travel through tunnel bridges. That meant the closest option was George Washington Bridge, and even though we were required to take the higher road, and the toll was more expensive, we considered it worthwhile and ventured on. Driving through the city, I don’t think we blinked. Nellie kept a lookout on the passenger side while I tried to keep maximum distance from oncoming traffic. Excited to find an RV park literally right next to the Liberty Cruise. 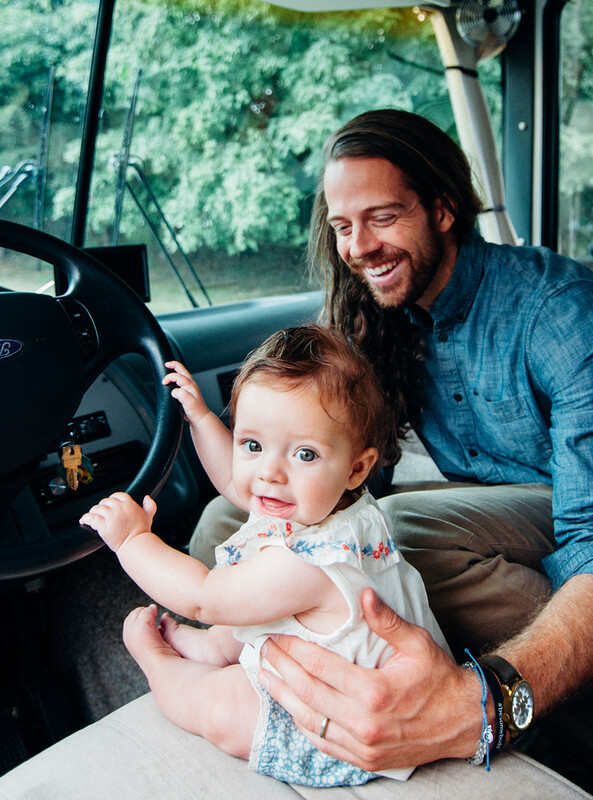 It’s never too early to start training Avalyn to drive, right? The drive became a marriage-bonding experience. We squeezed through quite a few narrow streets, uncomfortably. I gained a new respect for garbage trucks. At one crosswalk, a gentleman nodded in our direction. Once our eyes connected, he hit his chest a few times to show his respect for taking our big whale through the city. That actually helped us laugh and relax a little, and the rest of our drive was cautious but smooth. We were so close to Times Square, and we wanted to see if we could make it. The CoPilot app showed us one possible way. 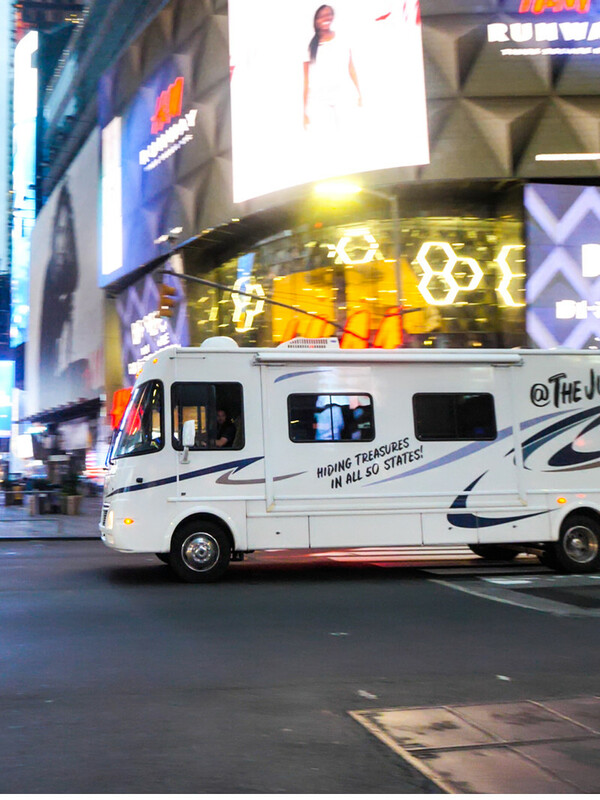 And as we drove through Times Square unscathed, we grew more confident that we could take our motorhome anywhere it could fit. Full disclosure—we still prefer the wide open roads of Montana or North Dakota. However, if a future adventure requires traveling through a city, now we know what to do. Many times, it’s also possible to avoid going through cities. Sometimes adding a couple of extra hours to the drive is worth saving the headaches and “I-didn’t-mean-that-when-I-said-it” moments. Our best financial and memory-making investment yet. Know your stats. Before driving at all, know the height, length and weight limit for your rig. Download a GPS app for RVs/Trucks. You can put in the measurements of your motorhome or trailer and it will direct you to the streets you can legally and physically drive down. The one we currently use is CoPilot. If you don’t want to use your phone and data while traveling, there are also various GPS units you can find online from $150 to $300. In the grand scheme of things, it’s a small price to pay for the peace of mind and safety in your journey. Know the rules around propane. It’s considered hazardous material and is illegal to drive through tunnel bridges. Look this up in advance! It will save you from having to turn around and backtrack—sometimes for long distances. Install cameras on the back, sides and front of your rig. If you’re towing, you should absolutely have a camera on the back to keep the tow in check. Many times, we found it easier to see the street lines and distances from cars parked on the street through our side camera feed than the actual mirrors. Look for the signs. Even if the street looks fine as far into the distance as you can see, if the road signs say to take a different route, like a truck route—do it. You may travel for miles, only to find a bridge that can’t carry your weight, or an extremely tight turn that you won’t be able to make. The truck route signs are strategically placed well in advance so you don’t have to back up and cause a ruckus in traffic. Hope this helps a few of you out there. We have absolutely loved our experience seeing the world from our own home on wheels. And any logistical headaches are worth the payoff of being able to appreciate more of the world as we take trips at our own convenience.